Have you ever or do you regularly have the sense that you can tune into your body and know what it needs to stay balanced and happy? The sages who first spoke about Ayurveda developed this capacity deeply; in fact, they could attune to their own organism to such an extent that they came to understand not just their body, but the human body and energy system in general. They were able to map out the physical and subtle bodies in great detail without ever cutting open one to see inside. They came to know the different subtle and physical elements which make up the human body and energy system as well as those things which promote health and happiness and those which lead to disease and distress. 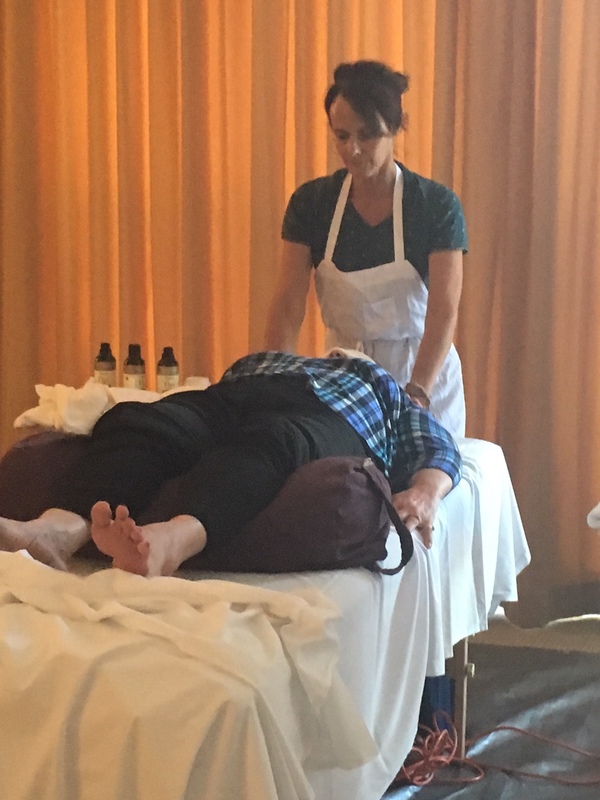 I have studied Ayurvedic medicine formally since 2011, and in that time, I have sat in classrooms with western trained doctors and scientists who have been deeply touched and amazed at the intricacy in which these ancient seers came to describe and understand the body. Synchronizing this ancient view with the western scientific understanding brings a more holistic (mind, body, spirit) and individualized approach to wellness and healing. My teacher, Dr. Vasant Lad’s greatest wish is for these two sciences to come together for the good of all. I’m aligned with and committed to supporting this vision. Ayurveda has nothing to do with eating a vegetarian or vegan diet. Right diet is determined based on an individual’s body type, their present state of imbalance, the season of year and one’s time of life. It changes with the seasonal shifts and the state of one’s digestive fire (agni). Ayurveda is closest in principles to Traditional Chinese Medicine (which evolved a little later), which similarly understands the five elements as comprising all matter, that individual constitutions vary; food and herbs can be used to heal and support the body/mind and that acupuncture points, called marma in Ayurveda, pressed or needled, can support the healthy flow of the life force (called Chi in chinese medicine and Prana in ayurveda) through one’s organism and that this smooth and balanced flow underlies physical distress. Ayurveda is not in opposition to Western (allopathic) Medicine. Ayurveda and modern medicine are very different systems with different strengths and weaknesses. Allopathic medicines or surgeries are especially useful when a disease process has lodged deeply into the body and cannot be reversed entirely or easily. This is allopathic medicine’s strength. Ayurveda is great as a preventive approach, tailored to the individual and including those daily practices (diet, lifestyle, herbs) that promote balance and health in the first place, as well as using gentle, constitutionally tailored seasonal cleansing to keep the organism strong over time. (An Ayurvedic approach is still helpful during allopathic treatment of disease in order to get at the underlying cause of imbalance that the allopathic medication or surgery is addressing, as well as for mitigating some of the damage of those treatments. Ayurveda believes that if we don’t treat and eliminate that underlying cause, treatment will ultimately be ineffective.). And, while Allopathic Medicine treats the disease without regard to the constitutional differences between people with that disease. Ayurveda treats the individual constitution and the medicines used to treat the same kind of disease will vary depending on individual differences. This is one of Ayurveda’s greatest strengths, and can make all the difference in how effective a treatment is. Following an Ayurvedic diet and lifestyle does not mean you have to cut out all the things you like to eat and live an austere life. Ayurveda is about balance. There are times to celebrate and enjoy a late night, a glass of wine and cake. And it is important to know and live within consciously chosen limits (yamas) if we are to feel well body, mind and spirit. Perhaps the biggest difference between Allopathy and Ayurveda is Ayurveda’s acceptance of mind, body, consciouness unity in an individual, while allopathy does not accept this unity or holism. More and more, studies are showing the great impact our mind and emotions (stress) has on the disease process and more and more doctors are prescribing things like meditation, yoga and relaxation as ways to support health. Ayurveda has always taught this. This past nine months were a clinical training year for me. I sat in the classroom each week observing and supporting my teacher with clients, and I saw clients every Friday as a clinician in our student clinic. I prescribed herbs, diet and lifestyle therapies, and gave ayurvedic treatments, mostly marma therapy and had the good fortune to work with supervisors who supported and helped guide my growing understanding of how to practice. I am excited to continue my work teaching others ayurveda and how to work with it at home through my online course Sacred Daily Essentials (we’re starting up again this fall) as well as working with clients one-on-one. If you’re feeling like you could benefit from customized diet and lifestyle support and herbs and want help tackling chronic low-level imbalances like over weight, low energy, chronic indigestion or constipation, irritable bowel, anxiety, depression or trouble sleeping, come see me. If you are working with a doctor for a more serious health imbalance, and want to know what you can do to support your body’s healing, I can help you there too. I am seeing clients on Thursdays in Wallingford. Email shannon@livingintobalance.com to schedule an appointment or to find out more. Each appointment includes a 15 minute marma treatment. Wash fruit and slice or pit. Add all ingredients to a bowl and dig in! Add all ingredients to your favorite wine glass or tumbler and enjoy!